Lumbini : Lord Buddha was born at Lumbini while his mother was on her way to parental home from Kapilvastu. Lumbini should be visited and seen by a person of devotion, Lumbini is the Mecca of every Buddhist, being one of the four holy places of Buddhism. Buddha was born in Lumbini during the full moon day in the month of Baisakh in 623 B.C. he was born under a Sal tree (Shorea Robusta) when Maya Devi was going to her maternal town on the occasion of delivery. After birth Buddha took seven steps towards north and, looking in all directions, he declared that "I am the foremost of all creatures to cross the riddle of the ocean of the existence, this is my last birth and here after, I will not be born again". This newly born Prince named Siddhartha had supernatural birth & signs, which indicated that the new born child will bring deliverance to the world. Ascetic (Rishis) warned the king that the boy might renounce the world anytime if he happen to come across: (1). The diseased, (2). The old man, (3). The dead body & (4). The ascetic.The king alarmed to hear this and married Prince Siddhartha at an early age and almost imprisoned him in pleasure palaces providing therein all kinds of enjoyments. Lumbini is situated in Nepal about 22 kms from Bhairahawa of Nepal in the foot hills of Himalayas. 122 kms from Gorakhpur city in Uttar Pradesh . 181 Kms from Kushinagar of Uttar Pradesh and 240 kms from Sravasti of Uttar Pradesh of North India. The place itself is interesting as a whole, the landscapes and the green forestry. However Maya Devi temple and the Stupas and the Pillar built by Ashoka are really worth a visit. Recently, several beautiful shrines have been constructed by devotees from all over the world. A visit to Lumbini is not only for spiritual enlightenment but also for solace and satisfaction that one gets in such a calm and peaceful place. 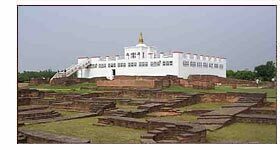 Maya Devi Temple - Lumbini remained neglected for centuries. In 1895, Feuhrer, a famous German archaeologist, discovered the great pillar,further exploration and excavation of the surrounding area revealed the existence of a brick temple and a sandstone sculpture within the temple itself which represents the scenes of Buddhas birth. On the south of the Maya Devi temple there is the famous sacred bathing pool known as Puskarni. It is believed that Maha Devi took a bath in this pool before the delivery. The temple is built gradually and is composed of many temples, one after the other. 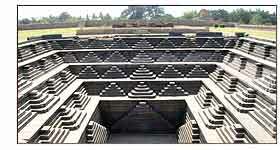 It is also found that there is possibility that a Ashoka Stupa existed in the place of temple. The Ashokan pillar - The Ashokan Pillar, essentially erected by Ashoka (249 BC) visited Lumbini and erected an inscribed Ashokan Pillar on the spot of Buddha's birth. The inscription of the pillar (the oldest in Nepal) declares that Ashoka granted Lumbini tax-free status in honor of Buddhas birth. It is 6m high and half of it is beneath the ground. It is behind the Maya Devi Temple, to the west of the temple. Emperor Ashoka erected many other pillars throughout India. The carved top of the pillar has never been found. The Buddhist monastery - Its built in the way of the modern Buddhist temples of Nepal but is quite important in the purview of architecture of the walls. The middle hall contains some exquisite murals resembling the medieval periods'. Kapilvastu - A holy destination related deeply with the life of a legend, Lord Buddha, eventually Kapilvastu is the place where Lord Buddha had lived the childhood and the days of teenage, in complete luxury. The capital of King Shuddhodhan, Kapilvastu still carries with it the mystic charm. It houses many sculptures of Buddhism, which present a landscape before that visitors that makes them feel calm, content. 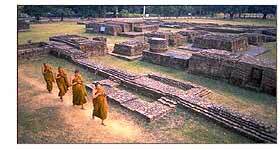 Kapilvastu carries the visitors away to the ancient days when Buddha was a small child, a prince. The place is situated 27 km south of Lumbini. Air - Bhairahwa is the nearest airport, 22 kms , well connected to Kathmandu airport. At present, about 22 international airlines connect Nepal to various other destinations in Asia and the Middle East. Rail - Gorakhpur, In India, is the nearest railhead, 122 km from Lumbini. Road - Good motorable roads connect Bhairahwa to Lumbini, and also other important cities of Nepal. India border is 22 kms. Some of the hotels in Bhairahwa are quite useful, but it is advisable to stay in the nearby Dae Sun Suk Gu Sa monastery in the village.